Last time, I abruptly closed in the middle of discussing using levels in maturity models. I’ll try and pick up right where I left off. “Multiple, independent input variables” is a fancy way of saying that many factors determine maturity. For example, doctors may categorize premature infants by gestational week. Infant survival is dependent on many factors: respiratory development, birth weight, gender, single vs. multiple birth, brain blood vessel health, ductus arteriousus closure, intestinal health, liver development, anemia, immune system development, mother’s health, medical team, and medical facilities. Some of these factors are interdependent; infants without sufficient respiratory development are most likely to suffer bleeding around the brain.1 Other factors are independent; the degree of respiratory development in the womb is largely independent of medical personnel available to the case. Still, the medical community finds value in grouping preterm infants by weeks gestation. Likewise, maturity models of complex systems like software development and genealogy can also find value using groupings, despite the existence of multiple input variables—factors. The result is a model that only approximates reality. The better the approximation, the more useful the model. Last time I also threw the term totally ordered set at you. That’s a fancy way of saying that to match the definition of “maturity,” the levels have to progress from one to the next. For example, if I gave you the numbers from 1 to 5, you could place them in ascending order. If I replaced one of the numbers with an apple, and another of the numbers with the color purple, there won’t be any natural order to the five items. To match the definition of maturity, a maturity model must define levels such that they are a totally ordered set. 1. “Quick Reference Fact Sheets: Premature Birth,” March of Dimes (www.marchofdimes.com : dated January 2009, accessed 15 November 2009). 2. Wikipedia contributors, "Capability Maturity Model," Wikipedia, The Free Encyclopedia (http://en.wikipedia.org : accessed 11 November 2009). There has been some excellent discussion of the Genealogical Maturity Model (GMM), both here and elsewhere. I see some points raised against the proposal have arisen because of my poor ability to write. I will supplement the misunderstandings by hurriedly throwing together today’s article. At a future time I will post an update to the model, incorporating some of the ideas from your comments and attempting to correct some of the problems you’ve identified. Today, let me address a couple of the concerns raised about the proposed GMM. The definitions of the words mature (the verb) and maturation include the ideas of “natural growth and development,” “the emergence of personal and behavioral characteristics through growth processes,” and “attain[ing] a final or desired state.”8 The word maturity can also refer to the level of maturity on the continuum towards that final, desired state. Maturity models, by their very name, are only models of the real world. The reduction from a real world maturity continuum to a model’s discrete number of maturity levels is arbitrary, although we’ll see some good reasons to do so. The number of levels varies among maturity models. Five may be the most popular number, but as we’ve seen, other numbers exist. Having more levels makes the effort to move from one up to the next smaller, which has motivational value. However, broad levels makes it possible to combine multiple, independent input variables while maintaining a totally ordered set of levels. That’s a little abstract, but it’s late and I’m off to bed. Stay tuned for responses to more concerns. In the meantime, continue to post your comments. 1. Wikipedia contributors, "Capability Maturity Model," Wikipedia, The Free Encyclopedia (http://en.wikipedia.org/w/index.php?title=Capability_Maturity_Model : accessed 11 November 2009). 2. Lee Copeland, “The Maturity Maturity Model (M3), Guidelines for Improving the Maturity Process,” StickyMinds.com (www.stickyminds.com/sitewide.asp?Function=WEEKLYCOLUMN&ObjectId=6653 : accessed 11 November 2009); this satire on maturity models contains a list of 34 serious models. 3. Wikipedia contributors, "Stages of growth model," Wikipedia, The Free Encyclopedia, (http://en.wikipedia.org/w/index.php?title=Stages_of_growth_model : accessed 11 November 2009); citing Richard Nolan, "Managing The Crisis In Data Processing," Harvard Business Review 57 (March-April 1979): 115–126. 4. Ali Arsanjani and Kerrie Holley, “Increase Flexibility with the Service Integration Maturity Model (SIMM),” IBM developerWorks (www.ibm.com/developerworks/webservices/library/ws-soa-simm/ : 30 September 2005). See also the Open Group Service Integration Maturity Model (OSIMM). 5. “Organizational Project Management Maturity Model,” Project Management Institute (www.pmi.org/BusinessSolutions/Pages/OPM3.aspx : accessed 11 November 2009). 6. Wikipedia contributors, "Business Technology Management," Wikipedia, The Free Encyclopedia, (http://en.wikipedia.org/w/index.php?title=Business_Technology_Management : accessed 11 November 2009). 7. Sonic Software, “SOA Maturity Model,” Progress Sonic, a website of Progress Software(www.sonicsoftware.com/solutions/service_oriented_architecture/soa_maturity_model/index.ssp : accessed 11 November 2009). 8. Merriam-Webster Online Dictionary (www.m-w.com : accessed 11 November 2009). I’ve yet to receive the prospectuses I’ve requested from the underwriters. But Ancestry.com posted it today with the SEC. Click here to see it. It’s time for a little news ketchup! 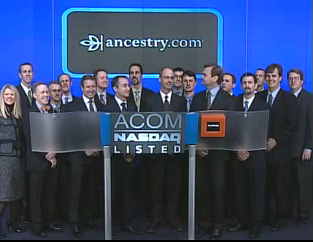 Yesterday, Ancestry.com announced the pricing of its IPO at $13.50 per share. And today is the day that Ancestry.com goes public! 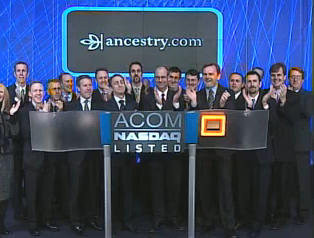 They began trading on the NASDAQ this morning under the symbol ACOM. You can read the announcement in the new Investor Relations section of the Ancestry.com corporate website. The Ancestry.com Investor Relations section includes a page for your smart phone with up to the minute news and stock quotes, no doubt delayed by 20 minutes. (As I write this before the market opens, the page optimistically shows a green up arrow.) And no doubt Ancestry.com employees will spend a record amount of time today watching the price of their stock change minute by minute and hour by hour. To see Ancestry.com's latest filings with the U.S. Securities and Exchange Commission, click here. Today is the last day to vote for your favorite blog. You can vote more than once. Stuff the ballot box for the Ancestry Insider in category #8! Click here to vote. Click here for more information. Today I've fixed yesterday's NFS rollout news. I miscounted the number of stakes in the Jordan River temple district. Thoughtful reader, RayDean, alerted me to the error. Good news. The rollout will likely finish a week earlier, before Thanksgiving. The corrected article is "NFS Rollout News for Election Day 2009." The corrections have also been applied to "Temple Districts Using New FamilySearch." For a little entertainment, try e-mailing a request for an Ancestry.com stock prospectus to the BofA Merrill Lynch e-mail address included in Ancestry.com press release yesterday (Prospectus.Requests@ml.com). Yesterday about 8:00pm e-mails sent to this address were answered with an automated message that they were out of the office until 16 November! We are down to just one red temple district before the rollout of New FamilySearch (NFS) is complete for all members of the Church of Jesus Christ of Latter-day Saints (outside the Orient). All too soon the rollout of New FamilySearch will begin to genealogists outside the Church. What is the Genealogical Maturity Level (GML) of the data in New FamilySearch (NFS)? Would you be comfortable showing off what is in there today? Does it reflect your personal Genealogical Maturity Level? Make this the day you elect to start adding high quality sources for correct information in New FamilySearch (NFS)! Mt. Timpanogos in American Fork went live on 19 October 2009! Bountiful went live on 26 October 2009! Draper went live earlier this week, 2 November 2009! Jordan River began going live, also on Monday this week! And finally, Monday also brought the announcement that Oquirrh Mountain in South Jordan will begin going live on 9 November 2009. Those predicting that the Salt Lake Temple would be last are correct. It remains the only red dot on the map. My predictions for the rest of the red-zone rollout? We already know that on 9 November 2009, Jordan River will complete, becoming temple number 123. On 16 November 2009, Oquirrh Mountain will likely become temple number 124? Also that day, Salt Lake will start with about 34 stakes going live? Then on 23 Number 2009, the final stakes in the Salt Lake temple district will receive access? What will we do then? Keep you informed of the rollout to the Orient and to genealogists outside the Church, of course! Stay tuned! When you get a go live date, let me know at AncestryInsider@gmail.com . And stay tuned to the Ancestry Insider at “Temple Districts Using New FamilySearch” for the latest news! Plans seem to be proceeding for Ancestry.com to go public this week. 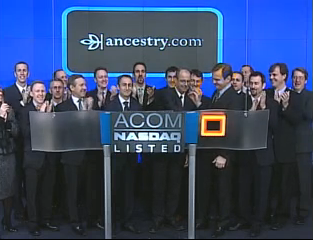 Renaissance Capital has selected Ancestry.com as its featured IPO for the week. You can read more here and here. Yesterday Ancestry.com filed a Form 8-A which I assume officially registered their stock for sale on the Nasdaq stock exchange. They also filed an amended S-1 statement reflecting a reverse 1-for-2 stock split that took place last Friday. This is a common step taken just before an IPO when the value of each share is too low to fall within the desired price range. Ancestry.com is targeting a price between $12.50 and $14.50 a share. So, for example, if shares were valued at $7 each, a reverse 1-for-2 stock split would take two shares valued at $7 apiece and exchange them for one share valued at $14. The offering consists of over 4 million shares of common stock offered by the company and under 3.4 million shares offered by current shareholders, making a total of about 7.4 million shares. This will bring the total number of common stock shares in the company to nearly 42.5 million. The company does not have any preferred shares, so Ancestry.com must expect a company valuation of about 658 million dollars on 217 million in revenues and 11 million in net income. About $12.1 million of the money raised is earmarked to repay CIT, which declared bankruptcy on Sunday. The repayment from Ancestry.com is a drop in the bucket for CIT. With 71 billion dollars of assets, it is the fifth largest bankruptcy in US history. The 2.3 billion dollars invested in CIT Group by taxpayers last December is expected to be totally lost. To see Ancestry.com’s amended S-1 filed yesterday, click here. To see their Form 8-A, Registration of Securities, click here.